Today I got a customer requirement where they had requirement to display data from Excel to their Web Site. I had done this with other earlier versions (ASP, VB), but never tried with .NET. I thought this to be very difficult and might took enough time to fetch and display the data on site. 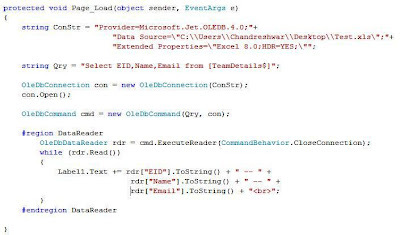 This can be done easily through ADO.NET in very simpler way by manipulating the ConnectionString.